The recent rise in popularity of the extremely flat faced cat has been astonishing. Fuelled by the extreme examples on instagram and other social media, people have been seduced by their ‘cuteness’. Flat faced cats have large, round eyes that are wide set, and in their most extreme form, often have a ‘goofy’ appearance, making them very cute. The veterinary term for flat faced cats is brachycephalic cats. The rise in their popularity has led to the more and more extreme breeding of these flat faced cats, which then creates even more extremely flat faced cats. As breeders we are constantly selecting which traits of our cats to emphasise and which to try to alter. Most breeders are responsible breeders, who place the health and wellbeing of the cat as their primary concern. But the trend for extremely flat faced cats is changing perceptions and expectations in some breeds and pushing breeders to breed more and more extreme cats. Breeders only have access to a limited pool of cats, and as the general type of the breed becomes more extreme, it becomes impossible to return to a more healthy, well balanced example of the breed. 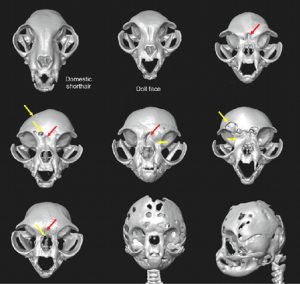 The image below shows how the skull changes shape with the increasing level of brachycephaly. For some time scientists and veterinarians have told us that these extremely flat faced cats must be suffering. In their most extreme versions cats are not able to open their eyes, and their tongues no longer fit in their mouths. But recent research has proven beyond all doubt that extremely flat faced cats are suffering. A recent study, published by scientists in Germany and highlighted by icatcare international, shows that extremely flat faced cats are suffering even more than we had previously realised. 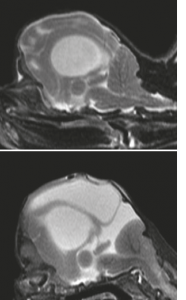 In the most extreme cases, the back of the brain was protruding out of the skull and into the spinal cord. These kittens were unable to stand or walk properly, had tremors, uncontrolled eye movements, misaligned eyes and abnormal breathing patterns. Perhaps most disturbingly, all of the owners of these extremely flat faced kittens reported that the kittens had episodes of long-lasting, aimless screaming. All of these kittens were eventually put to sleep. The researchers reported that owners of extremely flat faced cats referred to their cats as ‘dummies’ and explained that they often ran into things, and were less playful and interactive than other cats. The researchers found that breeders of these cats saw the extreme flat faced cats as simply an example of the breed, with a particularly pronounced flat-faced characteristic. Contrast this to brachycephaly in humans - if a human is flat faced it is seen as a sign of a serious underlying genetic condition. 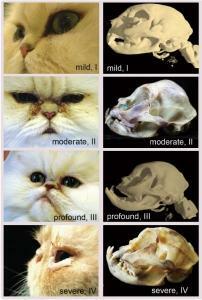 Flat faced cats suffer in a multitude of ways. Some clearly are so deformed that their skulls have become too small for their brains and their brains are literally being crushed. Clearly, there is a huge amount of suffering for the flat faced cat. Persians and Exotic Shorthairs are most affected. However, there seems to be a worrying trend towards breeding for extreme flat faces in many breeds. We have even seen extremely flat faced ragdolls on instagram, with all of the signs of extreme suffering that very flat faced Persians and Exotics exhibit. Is the British Shorthair affected? At this point in time, the British Shorthair cat is a healthy breed. Fortunately, the British Shorthair cat has not yet been bred to be extremely flat faced, and the GCCF actively discourages this. We will certainly never breed for extremely flat faced cats: health is our primary concern. We hope that by raising awareness of this issue, people will start to realise that, no matter how cute an extremely flat faced cat might be, it is never worth the pain and suffering that it causes. Should I buy an extremely flat faced cat? If there were no demand for extremely flat faced cats, that would very quickly bring an end to the breeding of very flat faced cats. We would strongly advise against buying an extremely flat faced cat. No matter how cute they might look, we cannot agree with bringing life into this world, knowing it will suffer every day. If you have fallen in love with the Persian or Exotic cat breeds, or the bulldog or pug, invest a lot of time in researching the problems involved and the tell tale signs of those problems. If you are still in love with the breed after all of that, then take the time to really find a breeder who breeds responsibly, is aware of all of the issues, and can tell you exactly what they do to reduce the risk. Many thanks to icatcare international for their constant and fervent support of our feline friends, good breeding practices and healthy cats. The problem actually seems to be even worse in pedigree dogs, with bulldogs and pugs being particularly affected. Around 50% of bulldogs are now unable to breathe properly and are having to undergo surgery to remove excess material from their throat and nose just so they can breathe in enough oxygen to live a semi-normal life.